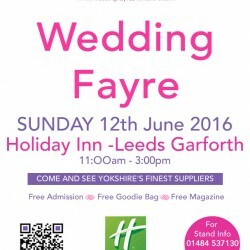 We are very excited to be part of Wedding Fayre Yorkshire’s, final wedding fayre of the season, at the Holiday Inn Garforth from 11.00 till 3.00pm. We would love you to come and meet with us and take a look at the products that we have to offer and how we can help inject the ‘WOW’ factor into your special day. ← Organising a party, wedding or a special event?